Gazebos are a great way to create an attractive outdoor entertaining area, while providing practical use as well. Gazebos can be used to add privacy, create a focal point, add shade and protection from sun and rain. With the addition of this structure, you’ll have added a whole new dimension to the backyard. Research has proven that people are overall happier when surrounded by beauty, and the addition of a gazebo can greatly improve your backyard experience. Homeowners may opt for a custom build by contractor, but this gets very spendy after you’ve factored in labour and material costs. Toady we review a gazebo by Yardistry. This model comes with an aluminum roof. 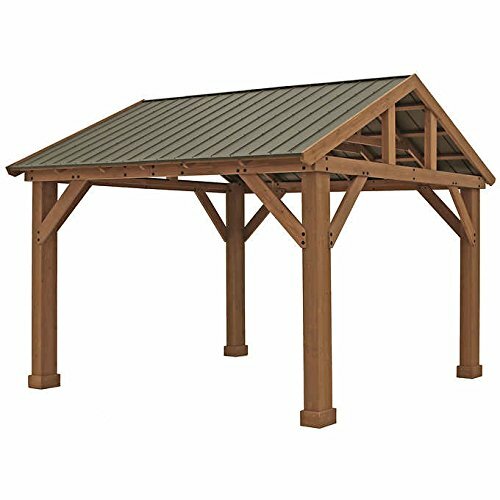 This is a sturdy, attractive feature that will be a beautiful addition to your backyard. It measures 12’x12’, about the size of an average master bedroom. It creates a homey space out of doors that is just lovely for use in the warmer months when you spend your time cooking, eating and entertaining on the patio. The roof will cast shade and protect you from the high heat of summer as well as sunburn, while creating an intimate space under which you can design an outdoor kitchen. The peaked roof will enable the ventilation of smoke if you choose to put a barbecue under the gazebo. Remember that barbecues should be placed a safe distance from furniture. Depending on your existing décor, you may want to stain and seal the pieces of wood before you put everything together. You will want to use strong anchor bolts, 3/8 for example. Be sure to go through all of the parts before you begin assembly, to make sure everything is included. Yardistry is a great company that will deliver any missing pieces overnight, so you can get right to assembling. From start to finish, this is a quality gazebo. You will have to put the roof pieces altogether first. Then you will want to get the posts and everything else in place. If you live in a climate with lots of wind, such as New England or anywhere that goes through a cold winter season, you will want to anchor the posts in concrete. Otherwise the gazebo will get knocked over. The holes are predrilled and lined up perfectly to make assembly easy for you. This is a quality gazebo made by a great company with attention to detail. As well, all lumber pieces are precut and are cut with precision, so you will not have to worry about adjusting any cuts. 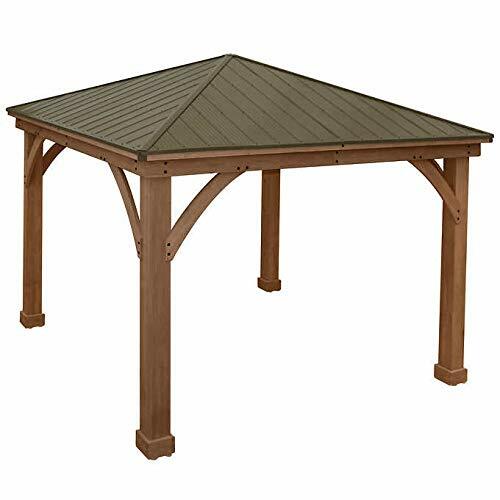 There are many pieces and parts that go into this gazebo, so you will need a small crew of three to four people. Be prepared for it to take a couple of days to assemble. Some people go hard for two days to get it up, and others space it out over the course of a week. The roof itself will require four people to set it in place. Watch this instructional video for a more detailed guide to setup and assembly. The video goes along with the included instruction manual to ensure exact steps. It’s especially helpful if you are a visual person and like to see things being done before you go ahead. The extra details in the videos are very helpful. Working on a flat, raised surface, like a saw horse or work table, will help ensure the pieces are level as you attach them. Have one person look down the beam to make sure its straight while the other person drills the pieces together. A plastic hook is provided so you can hang plants or light décor inside the gazebo. The aluminum roof is a nice bronze tone of brown, with reddish hue. It has a slightly rustic look, while being contemporary in design. The benefit of a hardtop is its longevity: it will hold up to windstorms and never fade. If your area receives snowfall, we recommend regularly removing any snow buildup from the gazebo roof. This will keep it strong and like new. Hardtop gazebos are more popular than ever, as they provide protection from the sun and rain, enabling you to enjoy your patio no matter what the weather is doing. The hard top provides perfect shade, while creating a centering structure that draws people into this focal point. 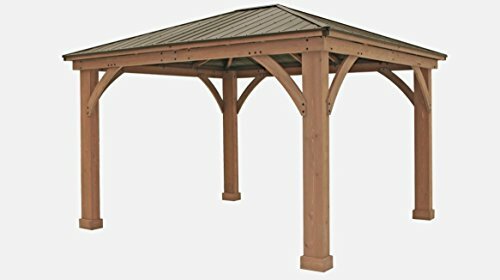 This will be installed as a permanent structure in your yard, and creates a nice feeling of being protected while having access to the open, fresh air. You can enjoy every aspect of summer living without sunburn or being exposed to rain. In terms of entertaining on the patio, the gazebo will provide a centralized area for people to gather. It will act as the perfect party anchor. You can purchase mosquito netting separately if you wish to surround the gazebo with it. 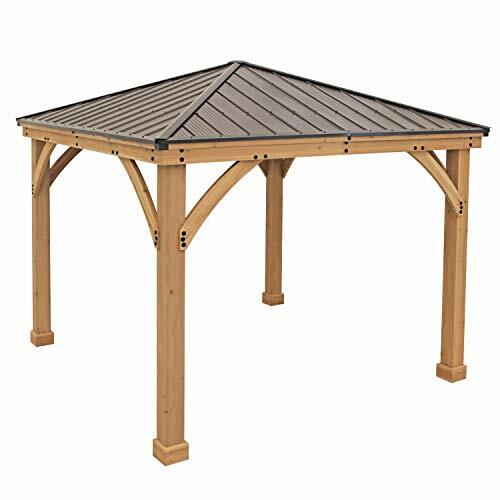 The Yardistry gazebo with aluminum roof sells for around $1800.